Lets look at some numbers first. Approximately 10% of America's youth is in scouting. 11 of the 12 astronauts who walked on the moon were scouts. Two were Eagle Scouts. 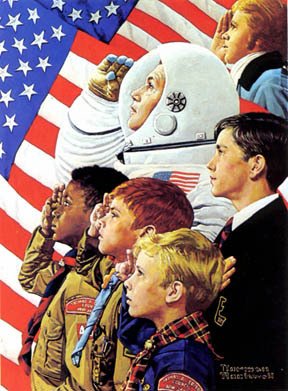 If Apollo 13 had landed on the moon, Jim Lovell, an Eagle Scout, would have been the third. The Apollo 12 space mission was the second mission to the moon and flew from November 14 to November 24, 1969 . Nixon said that as he looked at that plaque, he thought �These men went to the moon, one of the greatest achievements in the history of mankind, and the one thing they wanted to bring was something that showed they were once Scouts. No matter where they went, or how old they were, they remembered their time as Scouts." All Americans on the crew were in Scouting.